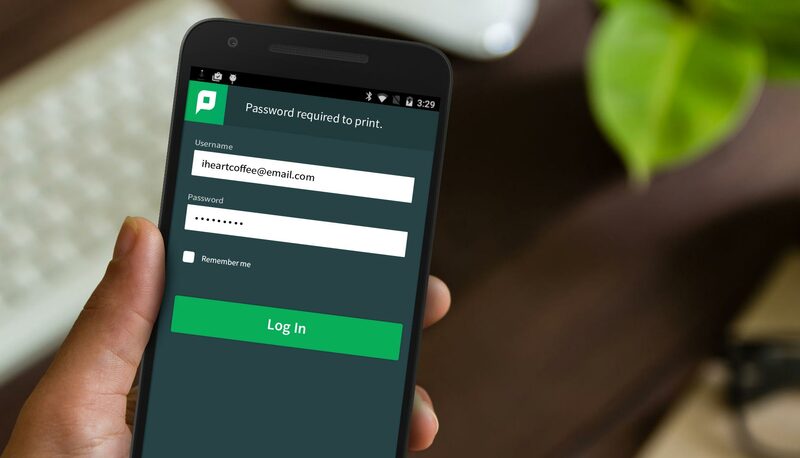 Give users the choice and freedom to print from whatever device is at their disposal. Mobility Print simplifies the printing process from bring-your-own devices (BYOD) and mobile devices. 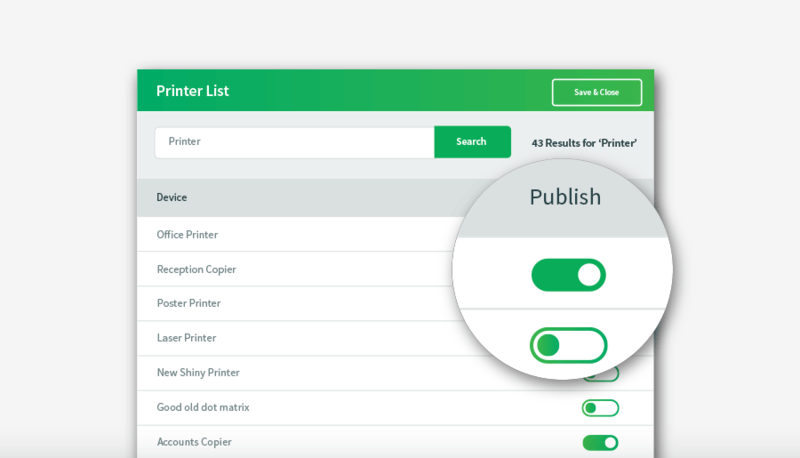 By following a few simple steps, users can quickly discover, and print to any of your printers, without assistance from a techie. This means SysAdmins get more time "playing with infrastructure" rather than dealing with frustrated end users. Have the software do the heavy lifting so printing "just works"
Currently supports iOS, Android, Chrome OS, Windows, and Mac OSX. Users can print without the need for a techie! Authenticates users without the need to join the device to the domain. With a few clicks, printers are published to all device platforms. Allows users to set up printing themselves without the need to contact a SysAdmin! 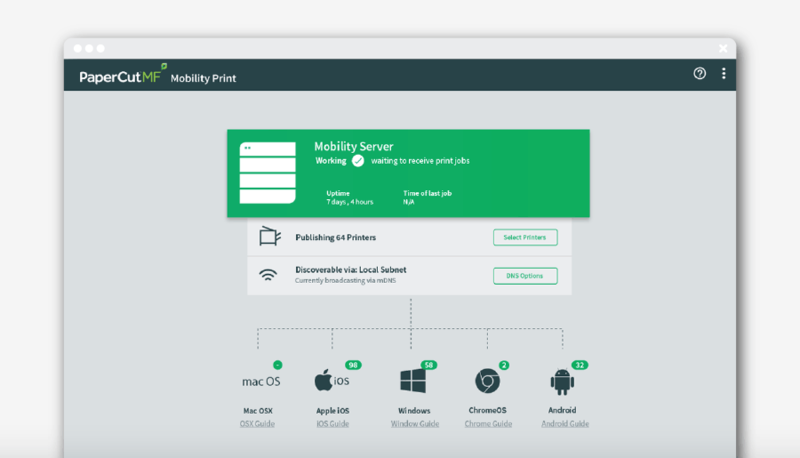 Mobility Print provides a native print experience for all operating platforms and devices consistently with your make or model of printer. And discovering printers is super simple, as there is no need to know the IP address of the printer or download brand specific apps, this just works. 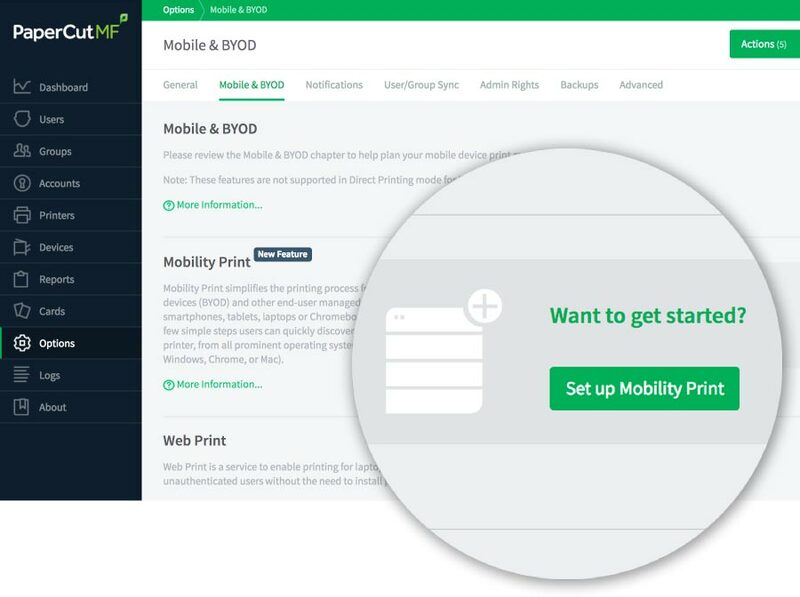 Setting up Mobility Print is super easy, with most installations requiring only a few clicks to get up and running. As new printers are automatically published, there is very little to do once setup is complete. It is designed to work reliably across networks of all types and sizes, scaling from small single subnet offices or small business, all the way to the most complex enterprise network serving tens of thousands of users. And most importantly, no more support calls! 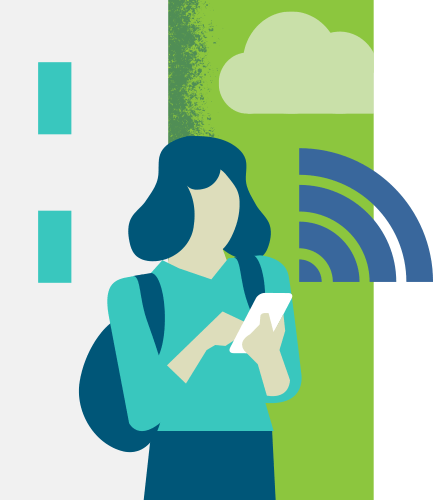 As IT has shifted from managed desktops over to BYOD (user-managed systems) and mobile devices, a whole new set of complexities has appeared. Wasn't technology meant to make our lives "simpler"? 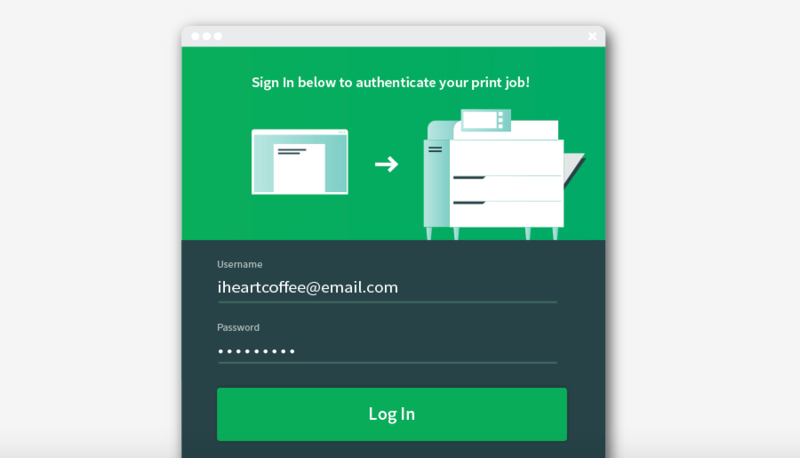 With the use of Mobility Print, users will be able to print with freedom and save valuable time by not having to wait to transfer files or fire up a computer in order to print. And when users pick up their print jobs, they can charge it to a cost center or take care of client billing right at the MFD. Users will no longer be limited to printing from work-issued computers or shared computers in the library. 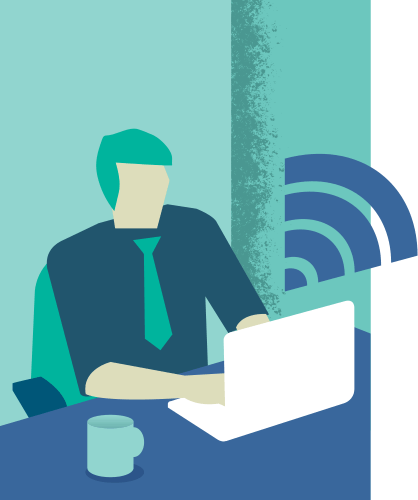 As long as they are connected to the wireless network, they will be able to print their personal laptop, smartphone or tablet. Something we have found over the years is that solving printing from mobile devices is not the whole challenge. Even on our customers' busiest sites, Smart phone printing makes up only 4%. The challenge is supporting the content creation devices such as BYOD laptops. These challenges exist in all organizations ranging from small businesses up to large enterprises. In particular, trends such as 1-to-1 laptop programs (1:1) in schools and colleges have added to the complexity. We've worked with printing in education now for two decades. Student printing is a challenge. Consider this situation: A student who wants to quickly print a document at their university, currently doesn't have a simple way to do it. If they were to print from a Samsung phone, they would have to download a printer app for Android, which might require configuration of the printer brand and model - details that they may or may not know. To print from a notebook, they may use PaperCut's Email to Print, which involves them emailing an attachment. Student printing should be simpler! 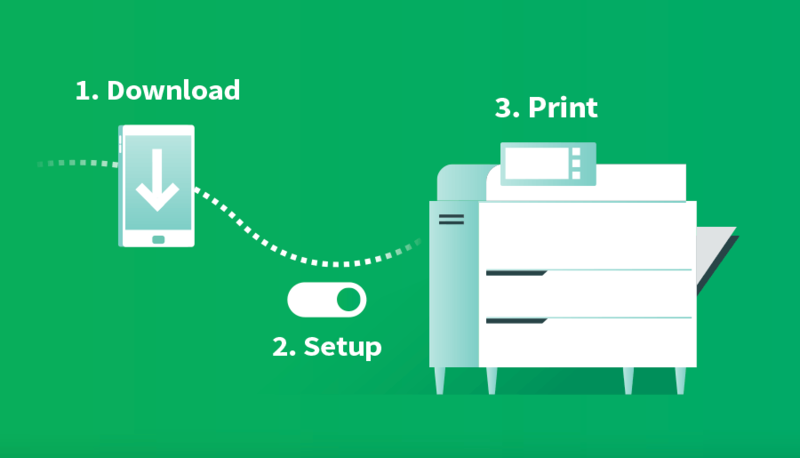 Whether they want to print from an iPhone, print from a Samsung tablet, print from the residential hall or print from a classroom, the solution should be the same, and the experience as easy as Files -> Print. Hey presto, that's Mobility Print! Our journey in enterprise printing has radically evolved over the last decade. We've seen printing change from "easy", to "difficult" again. Consider this situation: Your wife takes her laptop to her work, because they are encouraging BYOD. To print to a work printer, she needs to involve the SysAdmin or IT guys and get them to set up her machine to allow printing across the network and that's assuming they are nice enough and willing to help! Or she will be sent complex instructions about joining the Wi-Fi, then the domain, searching for and configuring the printer... it is all too hard. Well the IT department's dream of getting everyone printing from the personal devices is possible. That's Mobility Print. And as a bonus, it also helps with guest printing and visitor printing. To learn more about Mobility Print check out the Mobility Print Manual or to set up Mobility Print with PaperCut NG, head to the PaperCut Manual. To learn more about PaperCut's mobile and BYOD printing alternatives, check out Mobile & BYOD Printing in the manual or go to the mobile and BYOD tour page. Tip: Mobility Print can help when looking to implement a private enterprise cloud print strategy.